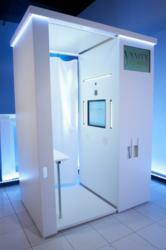 Incredibooths is offering a reduced rental rate for all 2012 reservations that are made during the Holiday Season! This gives everyone the opportunity to secure a fantastic NY photo booth rental at a reduced rate before 12/25/11. Party planners are always looking for something new, exciting and fun to add to events. Whether planning a wedding, corporate event, bar/bat mitzvah, sweet 16 or other event, Incredibooths can offer a revolutionary photo booth rental designed specifically for private events. To make things even better these incredible new york photo booth rentals are now available at a reduced price for all reservations made before December 25, 2011. Incredibooths has done away with the traditional, dark arcade style photo booth rental and replaced it with a cool, sleek, and stunningly good looking photo booth called the Capture Cube. However, this all white looker is much more than just eye candy! It boast a host of cool features like email and facebook upload, external slideshow, and the ability to vend enlarged 4x6 portrait photos in addition to the standard photo strips! And, when it comes to technology it packs a punch with a huge 21" color touchscreen, High-Def external screen display, Canon DSLR camera for perfect photos and computer software that could run a space station! Everyone in attendance at special events notices the difference as soon as they first lay eyes on this photo booth beauty. Once they actually get in for a photo session they are even more impressed by the ease of use and the speed of the professional 7 second photo printer! Even those with a shy streak tend to loosen up and get a little wild after piling into the photo booth to strike a pose. Everyone will get in the booth! A photo booth rental also makes a great favor, allowing guest to take home great photos that are customized with the event date and logo - this is perfect for weddings! The Capture Cube provides a unique and fun experience that adds an extra level of excitement that you and your guests will talk about for years. For more information on reserving your photo booth and taking advantage of this special offer contact Incredibooths toll-free at 888-474-8590 or by visiting incredibooths.com. Be sure to make mention of this press release when making your reservation.